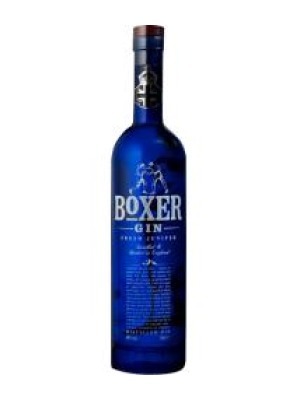 Boxer Gin is a popular Gin available from 31dover.com in 70cl to buy online. Visit 31dover.com for the best price for 70cl of Boxer Gin or compare prices on our other Gin products. The Boxer aims to deliver the classic London dry style of gin but with unprecedented vibrancy and complexity. The main balance of flavours is between fresh juniper and our triumvirate of citrus - lemon, orange and bergamot. This extra dry balance is set against a background of rich, woody spice and aromatic floral roots. The Boxer difference is most apparent on the nose and on the finish, atics stands up exceptionally well to tonic, remaining clear even on heavy dilution. When drunk neat or as a gin martini, the softness and luxurious texture of Boxer gin are most apparent and extremely welcome. Where to buy Boxer Gin ? Boxer Gin Supermarkets & Stockists. You can buy Boxer Gin online in most retailers and find it in the Gin aisle in supermarkets but we found the best deals online for Boxer Gin in 31dover.com, TheDrinkShop, and others. Compare the current price of Boxer Gin in 70cl size in the table of offers below. Simply click on the button to order Boxer Gin online now.